The upcoming Fire and Water DLC pack brings new traps, enemies and levels. Proving that orcs just can't catch a break, the popular action tower defense game Orcs Must Die 2 expands later this week. Sticking with the idea that good things come in three, the Fire and Water booster pack will feature three new traps, enemies and endless maps that players can romp through at their bloody leisure. The DLC launches later this week on Steam for $4.99. To aid in your Rube Goldberg defense against the Orc Horde, you'll have three new traps to work with. The Web Spinner lets you attach ensnaring webs to walls, slowing down enemies (and presumably dealing extra damage to the arachnophobic), while Ceiling Darts work just as you'd expect. The Floor Portal isn't as violent as it is just plain mean, as any enemies walking across it get teleported back to the start for another go. Robot Entertainment understands that you'll need more ewwy-gooie monsters to break in your shiny new toys, so they've also introduced elementals of titular fire and water. Fire Elementals shatter when killed, splintering off into Firelings that explode like suicide bombs. 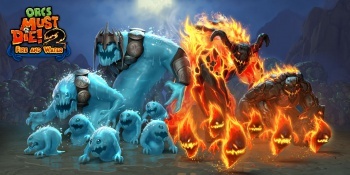 Water Elementals, on the other hand, only melt into puddles upon death. Yet, if any advancing Waterlings find their way into those puddles, they'll grow back into full Water Elementals and compound your problems. If you're one of those people who happens to dominate your friend's leaderboards, then the new Bonus Skull Challenge can help you to cement your genocidal dominance. By forgoing fancy, labor-saving traps and only using old fashion weapons like god intended, you'll earn yourself an extra "bonus skull" to use in upgrading traps and quantifying your abilities on the leaderboard.